It’s crunch time for Timeless and Blindspot. Deadline reports both series will be meeting about new seasons with NBC soon. Blindspot, which stars Jaimie Alexander and Sullivan Stapleton, will return on March 22nd. Ratings for the thriller drama have declined significantly since season one. Season two has earned an average rating of 1.10 in the 18-49 demo with 5.205 million viewers. For comparison, season one averaged a 1.83 rating in the 18-49 demo and a total of 6.92 million viewers. 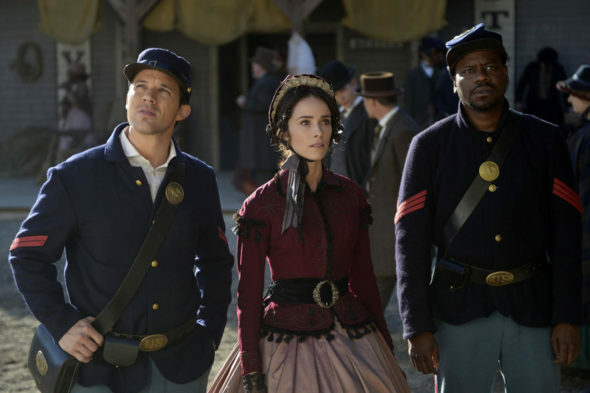 Meanwhile, Timeless has problems beyond low ratings. The freshman series is currently the subject of an ongoing copyright lawsuit between NBC and the Spanish media company Onza Entertainment. According to Deadline, the creators of both Timeless and Blindspot will meet about new seasons with NBC next week. Update: Timeless co-creator Shawn Ryan has tweeted that they’ll be pitching to NBC on April 2nd. What do you think? Do you watch Timeless and/or Blindspot? Do you think NBC should renew one or both? More about: Blindspot, Blindspot: canceled or renewed?, NBC TV shows: canceled or renewed?, Timeless, Timeless: canceled or renewed? I did not watch a ton of TV any more but NBC you will be making a big mistake if you cancel TIMELESS. I just love that show and consistently watched every episode. PLEASE DO NOT CANCEL TIMELESS. Please give us a new season if you not cancel this great show. Timeless. What a superb programme ! It has everything the armchair time traveller could ever wish for! Most of all it is pure escapism which is what all want sometimes,surely. The writing is terrible and the situations are ridiculous tonsay the absolute least. Each week watching someone who is supposed to be a trained Special Forces Vet either drop his gun be taken by surprise or just plain miss or be talked out of his mission is an insult to those of us who served. Cancel this travesty!! !